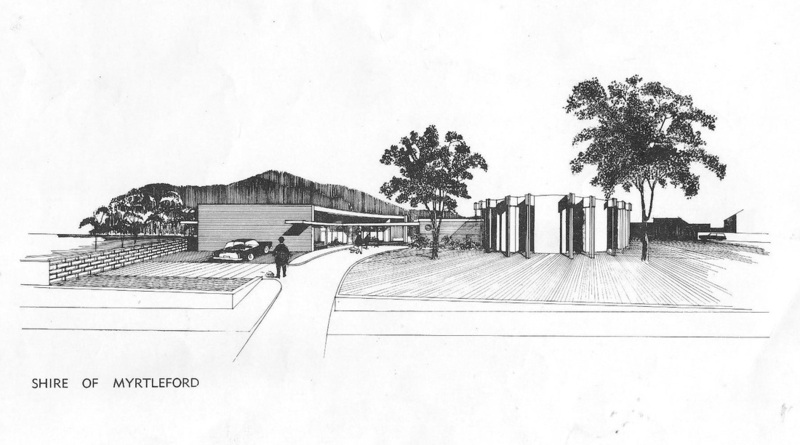 Myrtleford’s municipal history has its origins in the state of district roads back in the early years of gold discoveries from 1853, when roads passed through bogs and swamps. Agitation and a petition resulted in creation of the Buckland Roads District in 1862, charged with responsibility for road making and maintenance, the levying of property tax and operation of toll gates. The Myrtleford district was to remain under the Roads Board authority until it was incorporated into the Shire of Bright in 1866. In 1869, Ridings were introduced in the shire, with the West Riding based in Myrtleford with one representative on the council of nine. Nearby settlements with business ties to Myrtleford were also dissatisfied with the boundaries and long-term agitation for severance from the Shire of Bright, commencing in 1883 and again in 1894,began. Controversy over Ridings, rate revenue sharing and access to services continued into the 20th century, with the Myrtleford & District Progress Association being very active. An additional riding for the district was provided in 1956, after 30 years of agitation. 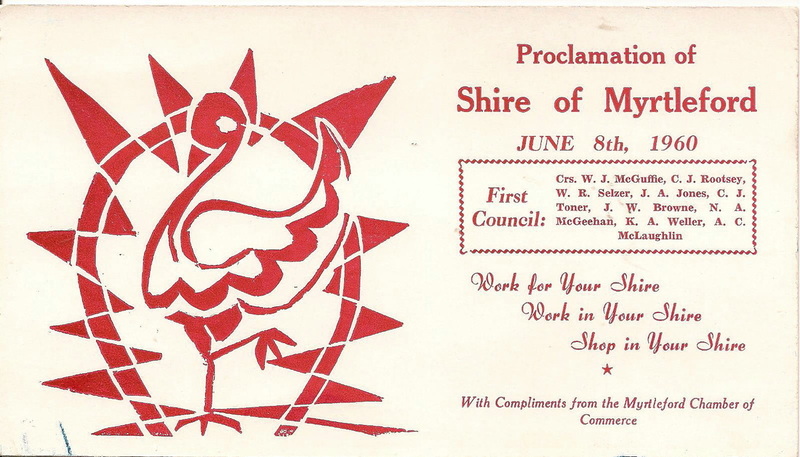 Over the next four years, a major effort to create a local municipality saw the Shire of Myrtleford proclaimed on June 8, 1960. It would take another seven years for new municipal chambers and offices to be officially opened. In 1934 a pipe was laid from the headwaters of the Buffalo Creek at the foot of Mt Buffalo to a concrete reservoir on the south-western side of reform Hill. The fall of the pipeline was such that pumps were not needed to deliver the water to the reservoir. The pipes in the town's reticulation system were made from tongue and groove timber boards, bound together by spirals of wire, then coated in bitumen. The Water Scheme was officially opened on the 19th December, 1934. One of these pipes is seen in the photo on the left, within the Museum's machinery shed. In the early 1950's the 'old reservoir' proved inadequate and was replaced with a second one in the northern part of town. However, due to expansion of housing and industry, a larger reservoir was completed in Nil Gully in 1971. The image to the left relates to 1934-35. The Nil Gully reservoir is built on the northern edge of the Reform Hill State Forest, and supplies ultra-violet and partially chlorinated water to the community of Myrtleford. 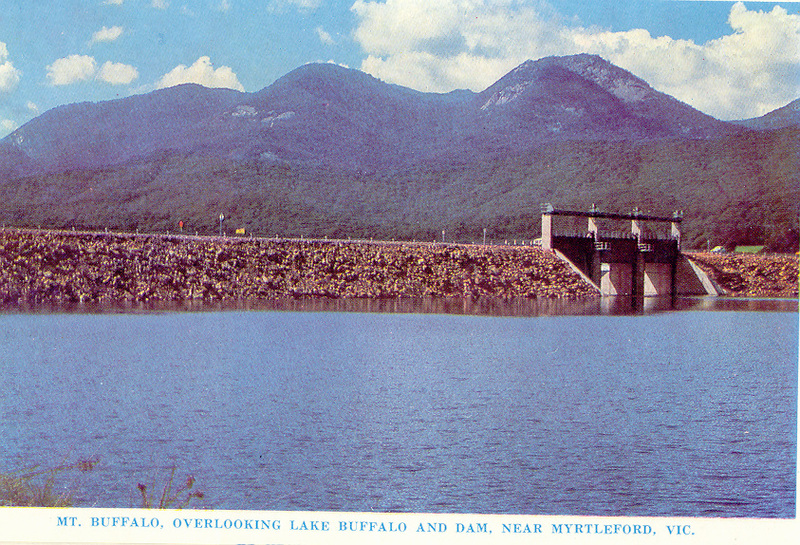 This photograph shows the new dam at Nil Gully, before it had started to be filled, in 1970. Candlelight was eventually replaced by kerosene lamps in homes and businesses before the end of the 19th century. Kerosene lighting in streets followed in the 1890s, under the control of H. Moore and then J. Lewis and Myrtleford’s first street light was erected adjacent to the post office. By 1910 acetylene gas lighting was installed and in 1924 the Butter Factory had its own generating plant. In 1926 the Co-op Store was sharing its power neighbouring business houses. Progress Association pressure, after rejection of an approach to the S.E.C., eventually led to the erection of privately-ran power plant by Block & Sons in Smith Street and the power was switched on March 28, 1934. The S.E.C. took responsibility for power supply in 1940. Prior to the arrival of railway transport in the Ovens Valley, movement of people and produce was handled by oxen teams (for heavy loads e.g. timber) and horse transport (e.g. stage coaches, drays, buggies, gigs). The first of these animals had arrived in 1837, when squatters occupied Myrtle Creek Run. From the 1850s, with the discovery of gold, a stage coach network linked Beechworth, Myrtleford and Bright, with an extension over the Australian Alps to Omeo in Gippsland. With the arrival of rail in Wangaratta in 1873 and a branch line extension to Everton in 1875, much local pressure saw the line reach Myrtleford in 1883. The station precinct included employee housing, the station, goods shed and sidings, turntable, cranes and stock yards. Until the rail extended to Bright in 1890, Myrtleford was the rail-head for coach passengers and horse-drawn goods further up the Ovens Valley. Stage coaches would leave the railway station, collecting passengers at local hotels as they left the town. On farms, horses would remain common until the early 1950s when the horsepower of tractors increasingly took over. The steady decline in use of horses had begun in the early 1930s, but they were still seen frequently in use on family outings until after World War 2. Passenger trains continued to serve the area for nearly 70 years, ceasing in 1952. Goods trains, bringing fertilizer, farm machinery, grocery lines and general freight items and taking out local primary produce continued until 1984 when the branch line was closed. School children selling posies of violets at the station to raise comfort funds for local soldiers in World War 1. Community “Welcome Home” ceremonies at the station for returned servicemen in World War 1. Special passenger trains to bring “susso” men to work on the first pine plantations during the Great Depression. The arrival of the Wirth’s Circus special train and erection of the tent on the railway precinct. Use of the local stopping places, e.g. Ovens, Gapsted and Bowman’s Forest, to catch a train into town for shopping or visiting friends and relations, thus avoiding use of horses and rough roadways. In 1965 the 23,900 megalitres Lake Buffalo storage, part of the Murray-Darling System, was opened, providing irrigation security along the Ovens River, securing Wangaratta’s reticulated water supply and providing a recreational outlet for fishing and boating enthusiasts. The construction of this storage initially faced strong resistance from the Buffalo River South farming community, as it resulted in the loss of many viable farms devoted to grain cropping, beef production and tobacco growing. The picture on the left shows the original site of the Dam. This photograph shows the dam wall and spillway following completion of the first stage. Enough land was purchased to allow the dam wall to be raised by 2 meters, which would increase the volume stored forty-fold.